The number above this crabby crustacean gets smaller with every attack, and it'll counterattack when it reaches 0! It'll also swipe away your boosted stats! 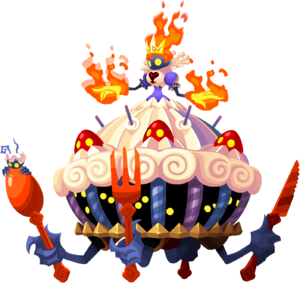 The Crabby Cake is a Raid Boss Heartless that appears in Kingdom Hearts χ during the 3rd Anniversary event. It reappeared as a boss to commemorate the fifteenth anniversary of Kingdom Hearts in the Japanese version of Kingdom Hearts Union χ, as a boss for the Third Raid Month event, from September 1, 2017, to September 30, 2017. This boss has a Magic body and limbs of Power. This page was last edited on 3 April 2019, at 17:05.